Zoie: 9 months old today! 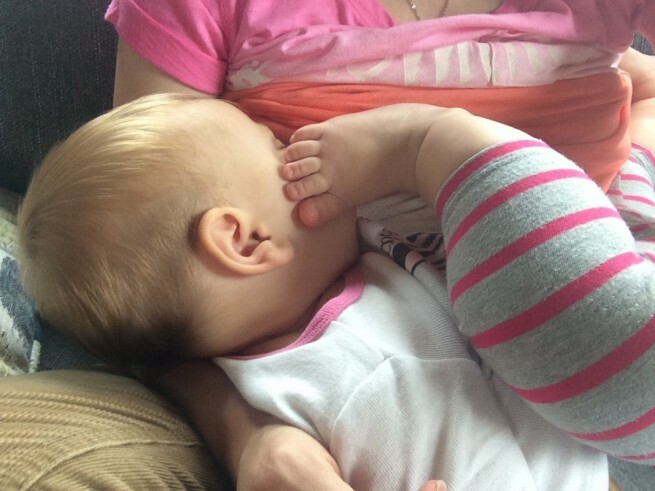 Breastfeeding is going great. I really love it and I’m so thankful for another great nursing baby. I kept getting a clogged milk duct on the left side and that was really annoying. The last time I got it I thought something was wrong and it freaked me out and ended up messaging my doula for tips. But I somehow worked it out and it’s fine now. You always bring your foot up to your face like it belongs there. And I can always tell when you want to go to sleep because you cover your face like turn out the lights please!! We’ve had hit or miss good sleeping lately. I think you’ve been teething which means waking up and not getting comfortable. Actually you did that like 3 days in a row and I was absolutely exhausted from it. You didn’t want daddy so I had to take you every time you woke up and you just wanted to nurse. So I would wake up exhausted and hungry!! I even slept over and got to work 1.5 hours LATE! Nevermind that my alarm didn’t even go off but I woke up just after 7 and that’s when I’m supposed to be there. It would probably help if I could go to bed when you do but I have stuff to take care of at night!! Napping is pretty good. If you sleep good long naps then it’s usually just 2 and then cat nap in the evening. If it’s only like a 45 minute nap then you might do that 3-4 times. I think you are a heavy wetter. We use the same system we used with Jonah and with you we have been adding an insert to your diapers because otherwise you leak! Also, we decided at this age out of you and the boys you are the busiest when we try to change your diaper. The minute you are laid down you are twisting around to go on about your day. I wanted to say you were pretty content with where you were at as far as crawling everywhere but the last day of you being 8 months old you decided you wanted to stand alone! I’ll be very surprised if you aren’t walking by your next update! We’ve been doing some signs with you. Mostly just milk and bath. You may understand milk but you don’t necessarily communicate with us yet. You’ve said mama and dada and bubba but nothing consistent where we know you are wanting us. Although I swear the other day you said Hey Girl! haha. You’ve been teething but still only have your 2 bottom teeth!! I thought one of your other bottom ones was coming in a couple months ago but it went away. And now we see one of your top eye teeth swollen a bit (left side) but it’s not ready yet. You are starting to notice if someone leaves the room and you are alone you cry big alligator tears. You are so over the moon in love with your brothers. The second you even hear one of them you are whipping your head around to find them. You want to do everything they are doing. It’s so funny thinking back to how Jonah looked up to Jaidan and now how they do everything together so I just imagine yall in the future. This is the first month where I’ve actually been sad that you are another month now. I just can’t believe you are 9 months old and WHY is it going so fast.